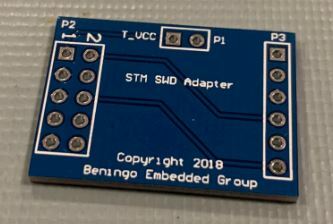 My adapter boards have arrived! As we discussed in the first two parts, the on-board debugger that comes with most development boards is functional but often offers far less than a professional debugger. 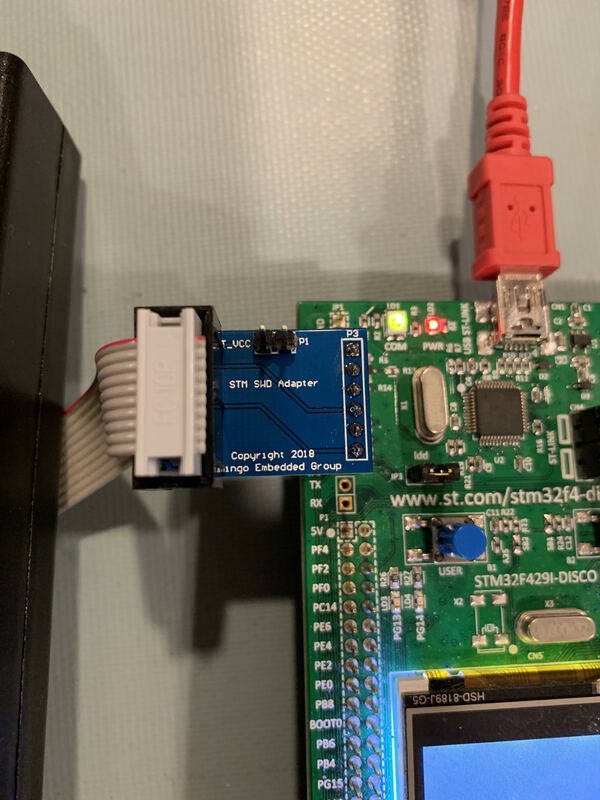 We’ve been exploring how we can create an adapter board for the ST Microelectronic development boards that will allow us to use an external debugger easily. In today’s post, we will examine the final results! Neither of these defects affects the way that the adapter would operate in the slightest. Given how quickly I put this board together and how I just guessed at the board size, I was pretty happy with the way the board turned out. In fact, these defects are so minor that if I didn’t point them out, they would probably not even be noticeable. The real test of course was whether I could program the microcontroller. 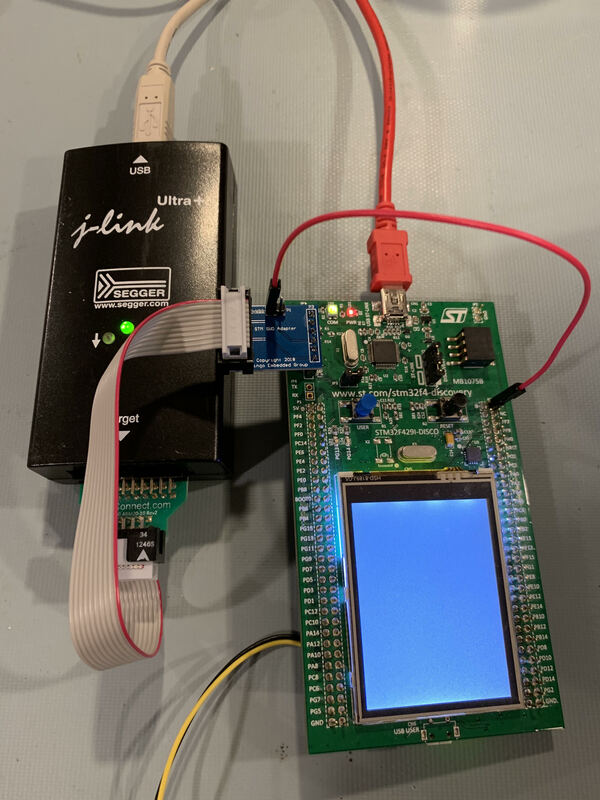 I connected the J-Link to my PC and attempted to program the board using a simple RTOS LED blinky program. Thankfully, everything worked as expected! No more jumper wires for me! (Well, just the one anyways for VCC). If you are interested in downloading the design files and gerbers that I used for this project, you can find them below. DIRECT, INDIRECT, INCIDENTAL, SPECIAL, EXEMPLARY, OR CONSEQUENTIAL DAMAGES (INCLUDING, BUT NOT LIMITED TO, PROCUREMENT OF SUBSTITUTE GOODS OR SERVICES; LOSS OF USE, DATA, OR PROFITS; OR BUSINESS INTERRUPTION) HOWEVER CAUSED AND ON ANY THEORY OF LIABILITY, WHETHER IN CONTRACT, STRICT LIABILITY, OR TORT (INCLUDING NEGLIGENCE OR OTHERWISE) ARISING IN ANY WAY OUT OF THE USE OF THESE FILES, EVEN IF ADVISED OF THE POSSIBILITY OF SUCH DAMAGE. Great to see it’s alive and works. Congratulations! Here comes a question though: would you be able to enlist functionalities you see as working, and what looks to be missing, or works but slighty slower with this particular set of 6 pins e.g. comparing to 20-pin ARM JTAG standard? I mean e.g. : SWO printf based debugging, pausing and stepping through a code, mem watches, profiling (e.g. from Atollic True Studio or simmilar), variable watching from STM Studio, basic mem read-write operations (e.g. 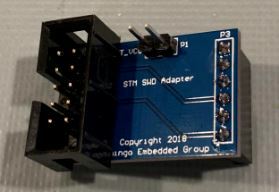 from SMT32 ST-Link Utility)? It looks codeload does work. Does it also reset a target after codeload (start the code) w/o a need of pressing the phisical reset button on the target (ST discovery) board? How about a speed (e.g. when writing or reading a content of a flash)? I know there are many questions here (some answers will probably come with a time), but even a partial info/response will bring a value. Thank you Jacob in advance for sharing your experiances on the matter. The on-board debuggers are very limited. They are designed to be a minimal solution to program a microcontroller. If you look at the datasheet, the connection speed is something like 15 kb/s on the ST-Link v2 versus 1 mb/s on the J-Link EDU. Far faster speeds are available on the higher end debuggers. Everything is faster using an external programmer through this adapter interface. There are also improvements based on the probe used such as unlimited break-points, the ability to access multiple buses simultaneously and so on. I will put it on my list to write a blog that compares a “stock” debugger with what I consider to be a “professional” debugger in a future post. Thank-you for the questions!